"Their primary target will be the power generators." Power generators were used throughout the galaxy to supply large amounts of power to cities, bases, factories, starfighters, and planetary weapons. Smaller power generators existed which were able to provide continuous power for portable heavy weapons, vehicles, structures, and machinery. Both the Galactic Empire and the Rebellion used power generators at their bases to keep their communications arrays, base shields, turbolaser towers, and mining facilities functioning at peak levels. 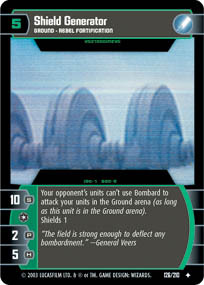 They were also used by numerous other factions such as the Zann Consortium and the Hutt Cartel. Power generators were used to power weapon emplacements and shields most of the time, but bases that were not high priority or not well funded sometimes used them as primary power sources. Their one major flaw was that they did not take battle damage well. A well-placed blaster shot would cause them to breakdown and stop working. During the Battle of Hoth, Major General Maximilian Veers' AT-AT Blizzard 1 was able to easily destroy the generator and power down the shield which had protected the Rebel troops' fleeing transports from bombardment by the Star Destroyers orbiting above the planet. The main reason power generators were so common was that they could could run on many different power sources, natural or otherwise; the one on Hoth, for example, was powered by geothermal activity. AlderaanMotors was one manufacturer of power generators.